The Get Justice Coalition: America, to be one big empty shell? America, to be one big empty shell? Will America be one big empty shell when the elite have looted all they can? Will the elite be outside the US when they bait Russia, China, or other nation into a nuclear war? The below is a comment posted in [an Opednews.com post authored by Dr. Paul Craig Roberts]. The ruling elite in the USSR, had luxurious accommodations on the Baltic Sea, in Klaepeda and Polanga, Lithuania, and elsewhere. I know, as I stayed there in 1993 or 1995. Government insiders sold off factory equipment, and items stored. A cookie factory had to use less sugar in cookies and then they tasted like crap as an official sold the sugar for the cookies on the world market. Those who don't own us in the US, are selling off the equipment, supplies, and paper on property on the world market. Do the elite, like George H. W. Bush, in America own entire islands in Greece? Are the elite barring citizens from their own land? If the elite start a war, they'll be somewhere else when all of America is one empty shell after everything of value has been looted by the elite. Obama is part of the process. Romney would have been part of the same process if the elite had installed him in as US President. The two party system in the US is their scam. I talk to self-employed people, and those who own, or did own small businesses. Town Hall, the state, and the US Government were out to fine, harass, stalk, terrorize, and make impossible USSR type paperwork and bureaucracy to end their business ventures. Writer Ayn Rand, born in Russia, pre-1917 saw shop owners and small farmers stripped of property and wealth to never work again. The most efficient, smartest, and most ethically inclined were starved, marched to death, and murdered in Siberia. Do you see any parallels occurirng inside the US, a version of Corporate Communism? Some key words: U.S. Attorney General Eric Holder said Monday he has appointed career federal prosecutor John Durham of New Haven to investigate whether the CIA or its employees broke the law by using overly aggressive techniques when interrogating overseas terror suspects. Holder said Durham's new duties, at least initially, will involve a relatively narrow, preliminary review to determine if there is enough evidence to warrant a full investigation of whether current of former CIA employees violated anti-torture or other laws when questioning high value, terror detainees. 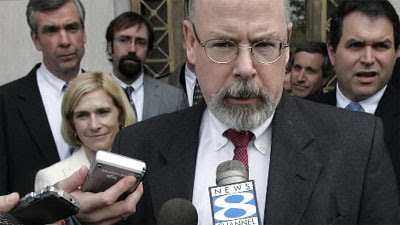 Durham was appointed in part, Holder said, because of his involvement in an ongoing, related investigation of CIA practices regarding terror suspects. In 2008, former U.S. Attorney General Michael Mukasey asked Durham to investigate the destruction of CIA videotapes of detainee interrogations. Some of the videotapings allegedly depicted brutal treatment, including waterboarding. Durham and a team of investigators are working with a federal grand jury in Virginia. "During the course of that investigation, Mr. Durham has gained great familiarity with much of the information that is relevant to the matter at hand," Holder said Monday in a statement released by the U.S. Department of Justice. "Accordingly, I have decided to expand his mandate to encompass this related review." Holder said Durham has a "strong investigative team of experienced professionals" in place and has been asked, in connection with the new appointment, to recommend "whether there is sufficient predication for a full investigation into whether the law was violated in connection with the interrogation of certain detainees." The new Durham appointment came in the wake of two other significant moves by the Obama administration in the area of the detention and interrogation of high-value terror suspects. The administration was preparing to release a newly unclassified, 2004 report by the then CIA inspector general detailing CIA treatment of terror suspects. The report says one interrogator threatened to kill the children of a Sept. 11 suspect, and another may have threatened to assault a suspect's mother in front of him. A federal judge in New York forced the administration to release the secret report after a lawsuit from the American Civil Liberties Union. President Obama also approved the creation of a new, multi-agency interrogation unit for suspected terrorists that will be based at the FBI but overseen by policy-makers at the White House and its National Security Council.. The HIG, or High-Value detainee interrogation Group, is considered by some observers as an administration effort to distance itself from allegedly coercive interrogation methods used by the administration of President George W. Bush. Holder said he decided to move closer toward possible criminal prosecution of CIA interrogators after reading a number of still-classified reports, including one by the Justice Department's Office of Professional Responsibility examining memos by Bush Administration legal advisers that authorized what Holder called "so-called enhanced interrogation techniques." The OPR report recommends that the Justice Department re-examine previous decisions to decline prosecution in several cases related to the interrogation of certain detainees, Holder said. He said he hopes to make much of the report public after it is vetted for classified material. "As a result of my analysis of all of this material, I have concluded that the information known to me warrants opening a preliminary review into whether federal laws were violated in connection with the interrogation of specific detainees at overseas locations," Holder said. Disagreements over the release of interrogation memos, photographs of detainees and what to do with detainees at the U.S. Naval Base at Guantanamo Bay, Cuba, have resulted in a year of political clashes over the shape of a future U.S. war on terror. Holder's decision Monday to inch toward a criminal investigation seems on its face to clash with the view expressed by President Obama, who has repeatedly said he wants to "move forward" rather than dwell on controversies generated by his predecessor. "I fully realize that my decision to commence this preliminary review will be controversial," Holder said. "In this case, given all of the information currently available, it is clear to me that this review is the only responsible course of action for me to take." The White House said Monday the decision of possible prosecution belongs to Holder. "The White House supports the attorney general making the decisions on who gets prosecuted and investigated," Deputy White House press secretary Bill Burton said. However, critics like U.S. Sen. Joseph Lieberman of began weighing in against Holder's decision Monday afternoon. "I respectfully regret this decision by Attorney General Holder and fear our country will come to regret it too because an open-ended criminal investigation of past CIA activity, which has already been condemned and prohibited, will have a chilling effect on the men and women agents of our intelligence community whose uninhibited bravery and skill we depend on every day to protect our homeland from the next terrorist attack," Lieberman said.